People with a gene variant that sharply increases the risk of Alzheimer’s disease in old age may show memory impairment earlier than thought—sometimes well before their 60th birthday, according to a new study in the New England Journal of Medicine. About 35% of Americans have one or two copies of this gene variant, inherited from one or both parents. People with one copy of the variant, called apolipoprotein E-e4 (APOE e4), have a 29% lifetime risk of developing Alzheimer’s disease, while people who don’t have it have a 9% risk. 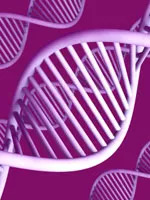 WEDNESDAY, July 15, 2009 (Health.com) — People with a gene variant that sharply increases the risk of Alzheimer’s disease in old age may show memory impairment earlier than thought—sometimes well before their 60th birthday, according to a new study in the New England Journal of Medicine. About 20% to 35% of Americans have one or two copies of this gene variant, inherited from one or both parents. People with one copy of the variant, called apolipoprotein E-e4 (APOE e4), have a 29% lifetime risk of developing Alzheimer’s disease, while people who don’t have it have a 9% risk. People with two copies of APOE e4 have an even higher Alzheimer’s risk, but it’s hard to define the exact percentage as only 2% of the population falls into this category. Despite the gene-related health problems, another study in the same issue of the journal suggests that people who learn they do have APOE e4 seem to handle the information pretty well. But the researchers excluded people with anxiety or depression, and they followed people for just a year. Therefore, the results don’t tell the whole story about what it would be like for most people to find out whether they carried the APOE e4 gene. Nevertheless, the findings are an important first step, says Kenneth Kosik, MD, a professor of neuroscience at the University of California Santa Barbara and the codirector of UCSB's Neuroscience Research Institute. If people do find out they have the APOE e4 gene, Dr. Kosik adds, the new memory study could make the news harder to bear. Richard J. Caselli, MD, of the Mayo Clinic Arizona, in Scottsdale, and his colleagues followed 815 people ages 21 to 97 with normal mental function, including 317 who had at least one copy of the APOE e4 gene. On one test of a person’s ability to learn and remember (the Auditory-Verbal Learning Test) gene carriers showed declines in their scores beginning in their 50s. For people without the APOE e4 gene, this decline started in their 70s. “We’re not talking anymore about a retired population; we’re talking about people who will be in the midst of their career,” Dr. Caselli says. He adds that many would be in positions of responsibility in which they need to have all their wits about them—and they may not. "[The study] forces us to really think about the brave new world of genetics,” and how this information might be used, Dr. Kosik says. Although there had been a “clear line” between having the APOE e4 gene but being dementia free and having Alzheimer’s disease, that distinction isn’t as clear anymore, he explains. Right now, APOE gene testing is only recommended for people with mild problems with mental function or dementia; for people with no symptoms, it should only be done in a research setting, experts say. Nevertheless, labs have sprung up that will offer the “worried well” an APOE gene test—for a fee. Having APOE testing without adequate medical, psychological, or genetic counseling is “inappropriate,” says Hyman Schipper, MD, PhD, FRCP, a professor of neurology and medicine at McGill University, and the director of the Centre for Neurotranslational Research at SMBD–Jewish General Hospital, both in Montreal. In these situations, Dr. Schipper explains, people may not interpret the results correctly, and could run the risk of psychological harm. For example, people who find out they carry the gene for Huntington’s disease—which means they have a 100% chance of developing a devastating neurodegenerative condition if they live long enough—do indeed experience anxiety, depression, and suicidal thoughts, Dr. Schipper notes. In the second study, Robert C. Green, MD, MPH, of the Boston University School of Medicine, and his colleagues in the REVEAL Study Group set out to look at whether something similar would happen to people who found out they carried the Alzheimer’s gene. They assigned 162 symptom-free people at random to a group who would receive their APOE genotyping results and a group who would not be told their results, and then checked their level of anxiety and depression—as well as stress related to the gene test—six weeks, six months, and one year after they got the news (or didn’t). All of the study participants had a parent with Alzheimer’s disease, but none of them had any signs of mental impairment or dementia. People who found out they didn’t carry the gene variant were less stressed about the test than those who found out they did carry the gene. Dr. Green and his team also found that the higher a person scored on initial tests of anxiety and depression symptoms, the more likely he or she was to be anxious or depressed after finding out about the gene, although the researchers had excluded people with severe anxiety or depression from the study. However, there were no differences between the groups that were told the news and those who were not. The fact that people in the study agreed to be randomly assigned to get their APOE results suggests they “are not representative of those who have a strong perceived need to know or need not to know,” Rosalie A. Kane, PhD, and Robert L. Kane, MD, of the University of Minnesota, in Minneapolis, wrote in an editorial published with the studies. The study also considered only the psychological impact of the news, they say. Some people might make major life decisions based on the news, such as deciding to hoard their money or spend it all. In addition, employers and health insurers are banned from discriminating against someone based on their genes, but companies offering long-term-care insurance, disability insurance, and life insurance are allowed to take this information into account. One major reason why learning APOE e4 status could be so stressful is that there’s no clear way to reduce Alzheimer’s risk. But there could be soon, some experts say. But, Dr. Caselli points out that trying to encourage people to exercise in order to prevent heart disease, for example, has been far from successful, and getting people to be active to ward off Alzheimer’s may be equally difficult. Maybe, however, the thought of losing our minds is a bit more motivating than the idea of heart disease. “There is some recent evidence to suggest, in fact, that personal knowledge of APOE status and general AD risk profile may spur healthy midlife adults to adopt or modify behaviors that might protect against the disease,” Dr. Schipper says. Apolipoprotein is a cholesterol-carrying molecule, and the gene that makes the protein comes in three slightly different versions—e2, e3, and e4 (there’s no e1). In addition to increasing the risk of Alzheimer’s disease, APOE e4 is also associated with a greater risk of heart disease.